What a rude Chevelle driver! First - He dares to be in front of me after i pulled up behind him. Second - He shows off his beautiful vintage A-body - ousting my old beater. 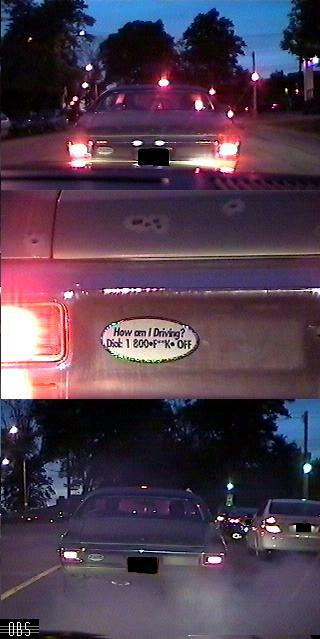 Third - A highly innaporperatie sticker telling other driver to F**K OFF. Forth - fake bullet hole stickers to indicate the owner loves gun violance. Fifth - Noise and oodor pollution - He "burned-out" his tires in front of me - harming my ears and my lungs!